Ever thought of leaving all your stress and duty behind? Well, Pilot's Rest is the perfect place for you. 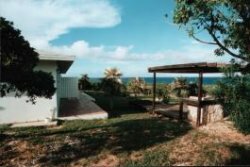 Pilot's Rest lies on top of a hill, surrounded by a wounderful landscape filled with palm-trees and an unrestricted on the atlantic ocean (beautiful sunrise), where you can smell a fresh breeze of the caribean sea. Quiet and empty beaches are wide-spread - the nearest only a 5 minutes walk away from Pilots rest. 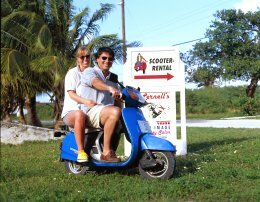 To explore all beaches of the island (like the famous beach at Cape Santa Maria ) you can rent a car or a motorcycle. 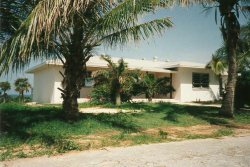 The villa consists of a generous sleeping and living room, a garden with a BBQ-grill area and a adjacent apartment. 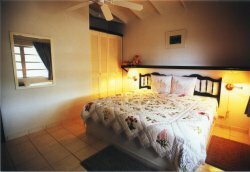 You will find everything needed for a comfortable stay in Pilots Rest. 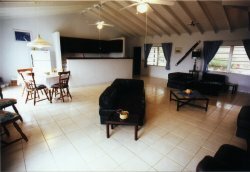 With the well equipped kitchen you can easily cook your cought (or bought) fish. 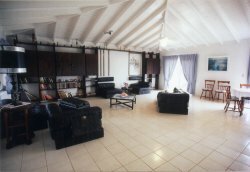 Available are 2 differend kinds of apartements: the villa with 2 bedrooms (Photo) or the apartment with 1 bedroom.